Mon, Jul 9, 2018, 09:33 pm SL Time, ColomboPage News Desk, Sri Lanka. 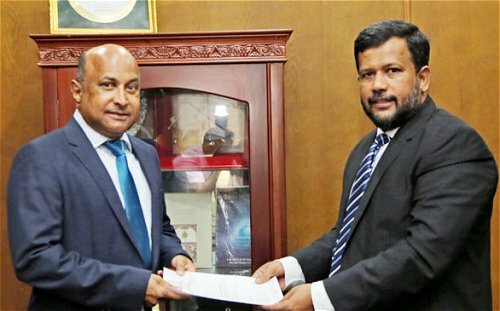 July 09, Colombo: Sri Lanka's Minister of Industry and Commerce Rishad Bathiudeen has appointed a one-time trial attorney at The Hague's International Criminal Tribunal (ICC) as the new Chairman of the Consumer Affairs Authority (CAA) which is under the Minister's purview. President's Counsel Anura Bandara Meddegoda has been appointed as the seventh Chairman of the Consumer Affairs Authority (CAA) of Sri Lanka on 6th July. Minister Bathiudeen extending his best wishes to the new CAA Chairman and stressed of his mandate. "A key priority of the Unity government is to protect the consumer wellbeing. CAA gives you a great opportunity to use your wide experience to serve our buyers and fulfil the consumer vision of the government," he said. President's Counsel Meddegoda with 37 years of legal experience has served in the Attorney General's department as a Senior State Counsel for nearly 20 years. Thereafter he joined The Hague's United Nations International Criminal Tribunal's Office of the Prosecutor as a Legal Adviser in 1994 and served for 10 years. He was appointed as Secretary Ministry of Justice and Judicial Reform in 2004 but had to skip due to his commitment with The Hague. After returning from The Hague in 2005, he continued his private legal practice and President Maithripala Sirisena appointed him as a President's Counsel in April 2017. Consumer Affairs Authority (CAA) is the apex government organization mandated to protect consumers' interests and ensure fair market competition in Sri Lanka.